For models of international trade to accurately represent the real-world costs, transport costs cannot be ignored. This column argues that, additionally, we cannot assume that transport costs are symmetrical, because of a backhaul capacity problem that constrains international shipping. Domestic tariffs, which benefit the domestic import sector and harm the foreign export sector in standard models of international trade, can also harm the domestic export sector and benefit the foreign import sector. In traditional models of international trade, such as the Ricardian model or the Heckscher-Ohlin model, transport costs are assumed away for simplicity. In the real world, however, we cannot ignore transport costs. As a rough estimate of representative trade costs for industrialised countries, Anderson and van Wincoop (2004) report that the ad valorem tax equivalent of transport costs (10.7%) is greater than the ad valorem tax equivalent of tariffs and non-tariff barriers (7.7%). Many studies have evaluated trade policies without due consideration of transportation, but taking it into account could fundamentally influence policy evaluations. One of the conventional ways to model transport costs is 'iceberg specification': the cost of transporting a good is represented as a fraction of the good, where the fraction is given exogenously. This specification assumes that transport costs are exogenous and symmetric across countries. Trade facts indicate, however, that such assumptions are not ideal when studying the impact of transport costs on international trade. In particular, market power in the transport sector and the asymmetry of trade costs are key characteristics of international transport (Hummels et al. 2009). Trade costs are asymmetric in several dimensions. First, developing countries pay substantially higher transport costs than developed countries (Hummels et al. 2009, Waugh 2010). Second, depending on the direction of travel, freight charges differ on the same route. For example, in 2009 the market average freight rate for shipping from Asia to the US was about 1.5 times of that from the US to Asia. Asymmetric transport costs are also associated with the 'backhaul problem', a widely known issue in transportation. To understand this problem, note that ships, aircrafts, and other means of transport normally take on another cargo after they unload their original cargo at the destination. Shipping is thus constrained by the shipping capacity (that is, the number of ships), and transport firms need to commit to the maximum capacity required for a round trip. This implies that there is an opportunity cost associated with a trip (the backhaul trip) with cargo that is under capacity. To avoid the backhaul problem, carriers must have a balance in shipping volume in both directions. Therefore the carriers adjust shipping capacities and freight rates. In two recent papers (Ishikawa and Tarui 2015, 2016) we pointed out that the presence of the backhaul problem may have important implications for trade policies, which have been overlooked in the existing research. Suppose that domestic tariffs increase when transport firms carry a full load on both legs of a two-way journey. Obviously, domestic imports would decrease due to the tariffs. To keep full loads in both directions, carriers have an incentive to raise the freight rate of shipping goods from the domestic country to the foreign country. They also lower the freight rate of shipping goods in the opposite direction to mitigate the import reduction. Because of these changes in the freight rates, domestic exports decrease while the carriers adjust their shipping capacity. In principle, domestic tariffs reduce domestic exports as well as domestic imports when carriers try to avoid the backhaul problem. As a result, domestic tariffs, which benefit the domestic import sector and harm the foreign export sector in standard models of international trade, can also harm the domestic export sector and benefit the foreign import sector. Imposing tariffs may not improve the country's welfare. This unconventional result occurs because carriers choose shipping capacity levels subject to backhaul problems, while the export sector cannot export beyond shipping capacity. Trade policy research has investigated whether removing import restrictions (for example by reducing tariffs) may enhance exports. Previous studies have identified several channels through which an import tariff reduction may influence exports. Early studies indicated the negative effect of liberalising imports on exports. For example, restricting imports could enhance exports when the protected industry exhibits increasing returns to scale (Krugman 1984). In contrast, more recent studies have identified positive effects. For example, a tariff reduction on intermediate goods may expand the sectors that use those goods as inputs, enabling them to increase their exports (Cruz and Bussalo 2015). This supply chain effect may work through the direct effects on production costs (they drop due to lower input costs) or the indirect effects through more intense import competition that cause productivity increases for the affected firms (Trefler 2004, Amiti and Konings 2007). Also, when the demand for final goods increases as trade barriers against final goods disappear, the demand for the intermediate inputs that go into those final goods also grows. If a country that imports final goods also produces intermediate inputs, it may be able to increase the exports of intermediate inputs as a result (Blanchard et al. 2016). In our research, we have identified endogenous transport costs as another channel through which import liberalisation has a positive effect on the country's exports (Ishikawa and Tarui 2015, 2016). This channel could be an empirical question of important policy relevance. Source: Average unit transport costs (in 1990 US dollars) for goods categorised in HS 62, 68, 71, and 73 are from OECD Maritime Transport Costs database (adjusted with US GDP deflator). Tariff rates refer to the weighted average of India’s HS six-digit level MFN rates using total imports as a weight. The data on MFN rates and total imports are obtained from WITS database and UN Comtrade, respectively. Figure 1 shows the relationship between India's import tariffs and the real transportation costs of the top exports from India to the US. It shows average unit transport costs for the two sectors with the highest export share in volume (HS68 'stone, plaster, cement, asbestos, mica, etc. articles', and HS73 'articles of iron or steel') and the two sectors with the highest export share in value (HS71 'pearls, precious stones, metals, coins, etc.' and HS62 'articles of apparel, accessories, not knit or crochet'). All values are normalised so that the 1991 values equal one. The downward trend in transportation costs is consistent with our theoretical prediction regarding the response of transport costs to changes in trade policy due to backhaul problems. A tax on shipping capacity could be equivalent to an import tariff on shipped goods. This implies that the subsidies on shipping capacity may work as a substitute for an export subsidy on shipped goods. If foreign countries hesitate to lower their tariffs, the domestic country could increase its exports by providing subsidies to carriers. The subsidies may also increase domestic imports (that is, foreign exports). Further studies exploring the transport sector 'behind the iceberg' – evaluating other trade-related policies given the endogenous transport costs – would be useful to identify other consequences of the backhaul problem and the industrial structure of transport markets. Amiti, M and J Konings (2007), “Trade liberalization, intermediate inputs, and productivity: Evidence from Indonesia”, American Economic Review 97 (5), 1611-1638. Anderson, J E and E van Wincoop (2004), “Trade costs”, Journal of Economic Literature 42, 691-751. Blanchard, E J, C P Bown and R C Johnson (2016), “Global supply chains and trade policy”, NBER Working Paper 21833. 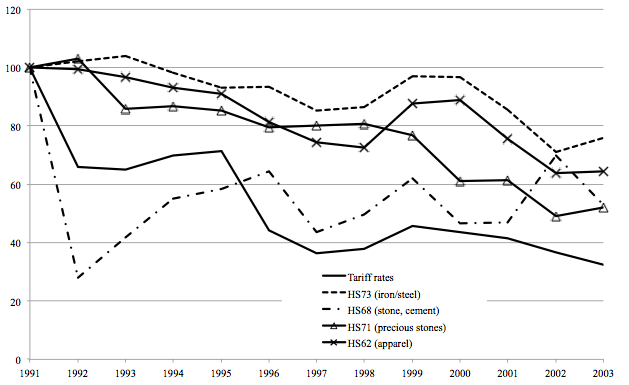 Cruz, M and M Bussolo (2015), “Does input tariff reduction impact firms' exports in the presence of import tariff exemption regimes?”, World Bank Policy Research Working Paper 7231. Hummels, D, V Lugovskyy and A Skiba (2009), “The trade reducing effects of market power in international shipping”, Journal of Development Economics 89 (1), 84-97. Ishikawa, J and N Tarui (2015), “Backfiring with backhaul problems: Trade and industrial policies with endogenous transport costs”, Discussion paper HIAS-E-12, Institute for Advanced Study, Hitotsubashi University. Ishikawa, J and N Tarui (2016), “Backfiring with backhaul problems: Trade and industrial policies with endogenous transport costs (revised)”, unpublished manuscript, Hitotsubashi University. Krugman, P (1984), “Import protection as export promotion: International competition in the presence of oligopoly and economies of scale,” in H. Kierzkowski (ed) Monopolistic Competition and International Trade, Oxford: Clarendon Press, pp. 180-193. Topalova, P and A Khandelwal (2011), “Trade liberalization and firm productivity: The case of India”, Review of Economics and Statistics 93 (3), 995-1009. Trefler, D (2004), “The long and short of the Canada-US free trade agreement”, American Economic Review 94(4), 870-895. Waugh, M (2010), “International trade and income differences”, American Economic Review 100 (5), 2093-2124. The US has been a major destination of India's exports (about 20% as of 2000).